The Construction Industry Transformation Map (ITM) was launched in October 2017 during the Singapore Construction and Productivity Week 2017. An advanced and integrated sector with widespread adoption of leading technologies, led by progressive and collaborative firms well-poised to capture business opportunities and supported by a skilled and competent workforce offering good jobs for Singaporeans. 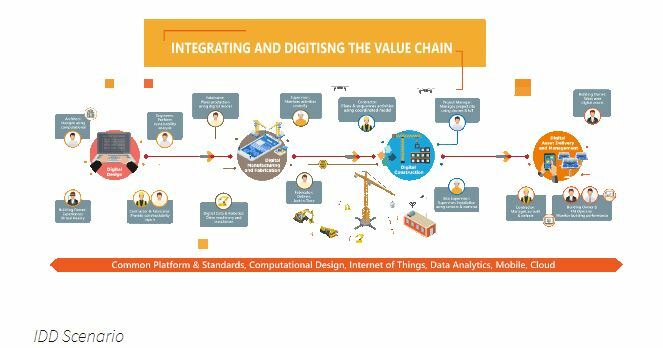 More info on the ITM …..
One of the key strategies to achieve this vision is to increase the adoption of Integrated Digital Delivery (IDD). 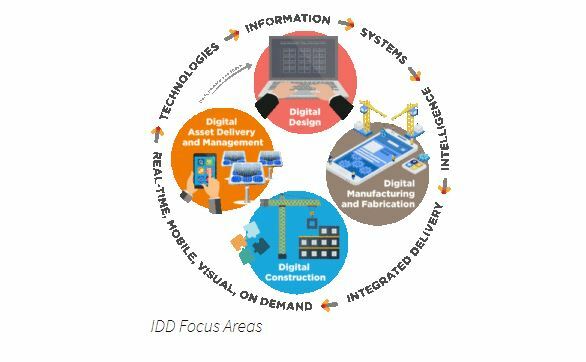 IDD aims to integrate processes and stakeholders along the value chain enabled by Building Information Modelling (BIM) and the use of digital information and technologies. Building Information Modelling (BIM) sits at the heart of digital transformation across the UK built environment. For the construction industry, a major part of the overall UK economy, it provides a critical opportunity to significantly improve performance and stimulate more innovative ways of delivery and operation. BIM is a collaborative way of working that facilitates early supply chain involvement, underpinned by the digital technologies which unlock more efficient methods of designing, creating and maintaining our assets BIM provides a digital representation of the physical and functional characteristics of an asset to support reliable decision making and management of information during its life-cycle. At its core BIM uses 3D models and a common data environment to access and share information efficiently across the supply chain and so boost the efficiency of activities around asset delivery and operation. By helping the entire supply chain to work from a single source of information, BIM reduces the risk of error and maximises the team ability to innovate. The use of parametric design models and space programming tools to enable 3D visualisation, walk-throughs, clash detection and coordination, item scheduling, etc. Sometiomes referred to as 3D BIM plus time, 4D BIM is where 3D objects and assemblies are linked with the project programme and phasing strategy and where resources can be quantified and scheduled. 5D BIM may be considered as 4D BIM plus cost where the BIM design is linked to the cost planning, bill production and estimating functions of the construction process.